GREENSPIN: a videopoem from Frome Media Arts on Vimeo. Helen Moore is an award-winning ecopoet and socially engaged artist based in NE Scotland, and has an MA (with distinction) in Comparative and General Literature from Edinburgh University. Her debut poetry collection, Hedge Fund, And Other Living Margins (Shearsman Books, 2012), was described by Alasdair Paterson as being, “in the great tradition of visionary politics in British poetry”. 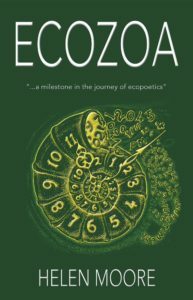 Her second collection, ECOZOA (Permanent Publications, 2015), which responds to what scientists have termed the ‘Anthropocene Era’ (by upholding Thomas Berry’s vision of the alternative ‘Ecozoic Era’, where, “we live in Earth as our community”), has already been acclaimed by a leading literary figure, John Kinsella, as “a milestone in the journey of ecopoetics”. Helen’s poems and book reviews have appeared in a range of national and international journals and magazines, and she is regularly invited to read her work at literary and environmental events – recent engagements include, at London’s Southbank, ‘Women Poets for the Planet’; Cheltenham Poetry Festival; and a seminar on ‘Art for Earth’s Sake’ with students at the University of Gloucestershire. 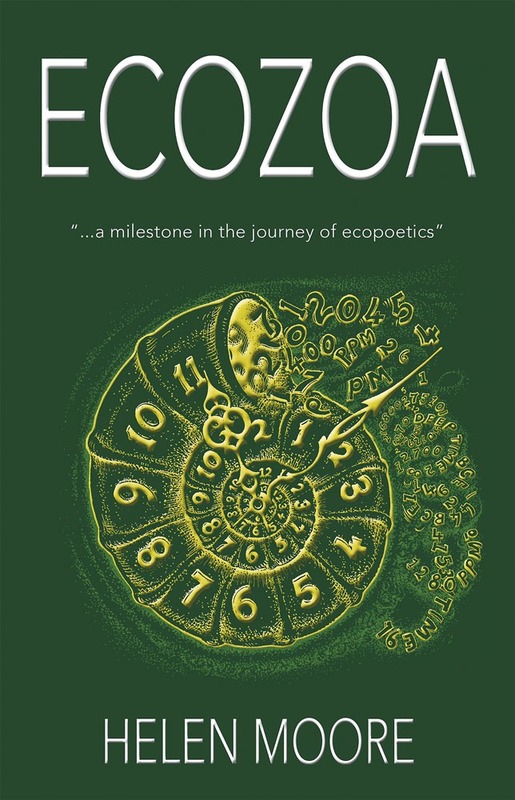 A recording from ECOZOA was featured as part of the programme at ‘Hacking the Anthropocene’, a symposium at Sydney University’s Environment Institute in April 2016. As a freelance socially engaged artist, Helen facilitates poetry/creative writing programmes, often to support health and wellbeing in the community. She has also collaborated on a range of ecologically oriented projects, and in July 2016 completed a 21 month long residency with Last Tree Dreaming, a Heritage Lottery funded community project raising awareness of the heritage and future of Selwood Forest in Somerset..
‘Greenspin, a video-poem made with film-maker Howard Vause, won 3rd prize in the Liberated Words International Poetry Film Festival in 2013. For the October 2014 issue of Interalia Magazine, Helen was commissioned as guest editor and chose a theme of Ecocide: Arts, Resistance and Social Change. Helen’s long poem, ‘Earth Justice‘, was awarded 3rd prize in the Second Light National Women’s poetry competition, 2013and a recording was commissioned by Resurgence & Ecologist to mark National Poetry Day 2012. Her hymn ‘glory be to Gaia’ was set to music by Guy Wilson and sung by a massed choir in Winchester Cathedral as part of the ‘Futures of Capitalism’ 2014 programme. Helen is currently working on a 3rd poetry collection, exploring ‘First Contact’ between the colonial British ‘Mother Country’ and Australian Aboriginal cultures, as part of a theme around disinheritance. She is also developing new arts and sustainability projects in Scotland. * the many facets of the feminine and the beauty of Mother Earth.